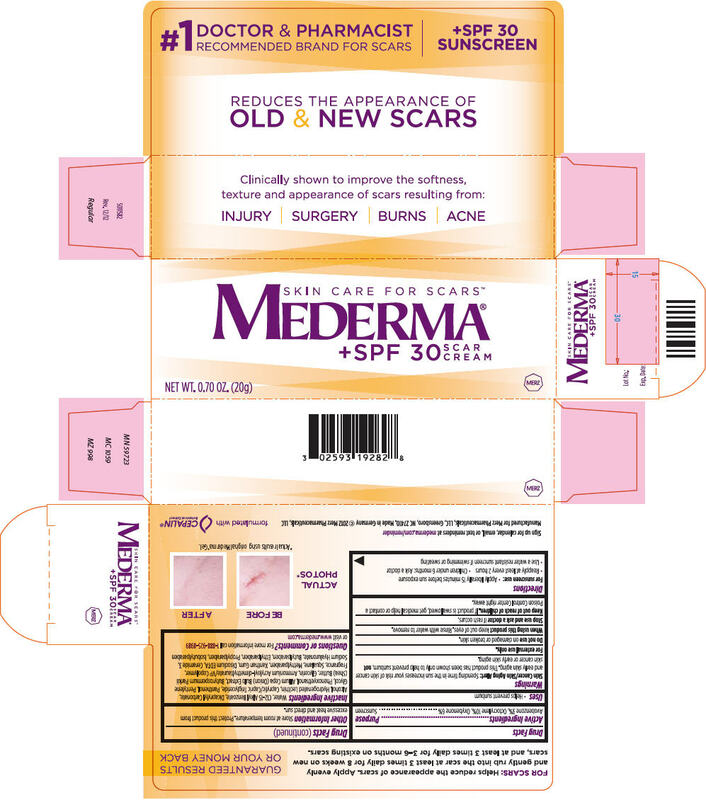 Mederma® Cream should be evenly applied and gently rubbed into the scar 3 times daily for 8 weeks on new scars, and 3 times daily for 3â€“6 months on existing scars. Also apply Mederma® Cream to the scar before sun exposure. WATER, ALLIUM CEPA (ONION) BULB EXTRACT, C12-15 ALKYL BENZOATE, DICAPRYLYL CARBONATE, HYDROGENATED LECITHIN, CAPRYLIC/CAPRIC TRIGLYCERIDE, PANTHENOL, PENTYLENE GLYCOL, PHENOXYETHANOL, BUTYROSPERMUM PARKII (SHEA BUTTER), GLYCERIN, AMMONIUM ACRYLOYL-DIMETHYLTAURATE/VP COPOLYMER, FRAGRANCE, SQUALANE, METHYLPARABEN, XANTHAN GUM, DISODIUM EDTA, CERAMIDE 3, SODIUM HYALURONATE, BUTYLPARABEN, ETHYLPARABEN, PROPYLPARABEN, ISOBUTYLPARABEN.